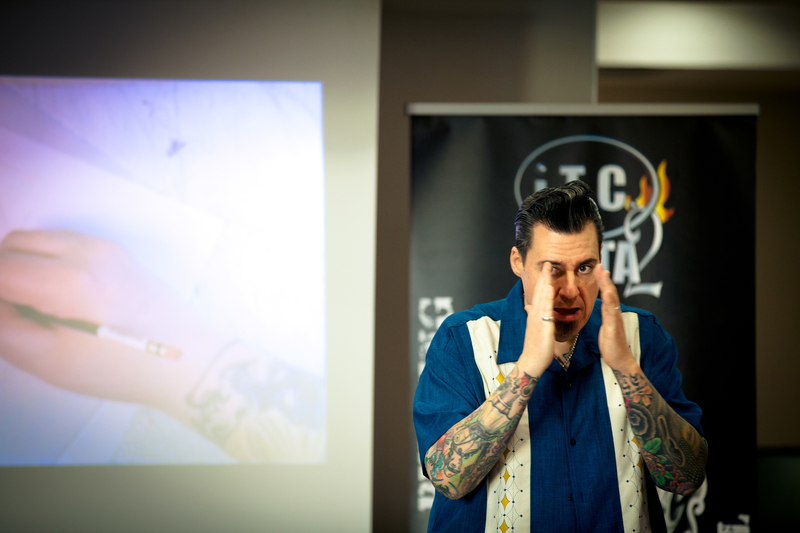 The American tattoo artist has recently been voicing his anger at the growing number of private tattoo schools – a stance shared by the Tatouage & Partage association, which is also strongly opposed to this blight on our profession. In this video posted in the United States on July 23, 2017, Joe Capobianco reaffirms his commitment to fighting against private tattoo schools. The Internet user who shared this video along with his own interpretation of its content is a certain “Constantin Vanderplume” (Cyril Auville by day), and better known by the name of Tin-Tin, president of the SNAT (Syndicat National des Artistes Tatouers, “French National Union of Tattoo Artists”). In just 70 words, Tin-Tin gives an example of what he does best: Using retrograde and obsolete methods such as slander, threats, insults and, above all, fake news. The SNAT continues to cultivate and maintain this divisive subject which is detrimental to us all, and which reinforces the denial and scorn of politicians with regard to our activity. It is with a certain sadness and pity that we have once again observed the same methods used by the president of the self-proclaimed union. Is it helpful to remind people that Tatouage & Partage is strongly opposed to private tattoo schools? Is it useful to remind people that the professional qualification for tattoo artists was invented by Tin-Tin himself to scare our community and try to discredit us? Unfortunately, there are already private tattoo schools in France, and this is the common enemy we should all be fighting against together. But instead, we are slandered by the SNAT as they attempt to hide the fact they have failed to obtain any specific legal status for tattoo artists in 15 years. They are using us as a scapegoat while assuming that no one understands their methods. And yet they are wrong. I have no wish to feed this polemic. I will however say that Tin-Tin seems to be more of a burden than a standard-bearer for our profession, in the same way every movement has spokespersons who harm the cause. The SNAT would do well to review the members of its board. At Tatouage & Partage, we fight every day to find solutions: We support the teaching of tattoo artists by professionals as part of a specific legal status that should be introduced by the government, as is the case for all disciplines requiring vocational training and learning led by professionals. Crying over spilled milk will not help the situation. Solutions will. The tattooing profession is drawing increasing numbers of people, driven in part by reality TV shows. Saying no to training and teaching paves the way for private tattoo schools. One unanswered question still remains: Why is the SNAT not fighting against existing private tattoo schools, instead of attacking those yet to be opened? It seems that pretending to act is an effective way of covering up incompetence.